Roots: As deep as 4 to 6 feet. Heavy waxy layer on the roots prevents them from drying out. Ecology: Requires excellent drainage and mostly full sun. One of the most drought resistant bunchgrasses. Throughout the West, crested wheatgrass has overtaken much of the historical range of bluebunch wheatgrass. Although it can be a crucial source of forage, it is not necessarily the most highly preferred species. 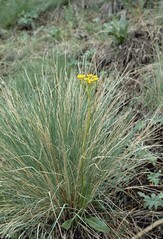 Fire tolerance: Usually survives fires because its buds are protected by soil and/or plant material.